I got a bad wasp bite the other day, normally I do just fine with wasp bits. Not in this case though. My arm swelled up really bad, it looked like I had Elephantitis. It never really hurt, it has really itched a lot though. I have been putting cream on it and ice wrapped in a towel. The swelling has gone down a little today. Seems there have been so many pictures of Phoebe, my mother is making me put this one of me as a baby up. I was a funny looking baby. Now the whole word knows, even all my friends. 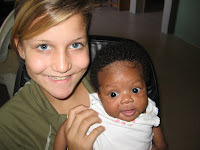 Also, I had a lot of fun answering the questions from great Uncle Al about school in Haiti, so if anyone wants to ask anything about living in Haiti, e-mail me at paigeinhaiti@yahoo.com I will answer it on the blog.